I don't usually do any posts not about books but I've been thinking about making this post for a while now. As usual this is in no specific order. I love Taylor Swift. She is really honest about things in her songs, she doesn't sugarcoat anything, which makes all her songs so relatable. She's also an amazing person. I have watched most documentaries I can find on her and everyone they interview about her always says that she is so down too earth. A breath of fresh in today's media. Avril Lavigne was the first singer that I ever really feel in love with. I probably first listened to her when I was 5 or 6 and I instantly feel in love with her songs. She unlike Taylor is less of a role model but I still think that she is an incredibly talented artist. In her most recent album, she wrote all of her songs as well as producing some of them. 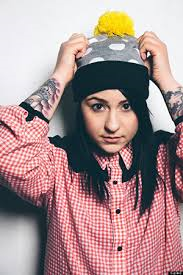 Lucy Spraggan was on the x factor a couple of years ago and like any people I loved her after her first song. I sadly haven't seen her in concert yet but she is definitely next on my list.